Posted by Bob and Robin in Acme Bake Shop, Acme Bake Shop Focaccia, Acme Bakery, Avocado, Bacon, Beans, Black Beans, Boise Farmers Market, Breakfast At The Captains Shack, Breakfast With Robin, Brown Basmati Rice, Captain's Shack, Cinco de Mayo, Comfort Food, Corn, Dinner With Robin, Eggs, Feta Cheese, Focaccia, Herbs and Spices, Homestead Natural Foods, Idaho Pork, Local Farmers Markets, Local Harvests, Local Markets, Meadowlark Farms, Omelet, Party Time, Peaceful Belly Farms, Photos, Photos By: Bob Young, Pork, Pork Tenderloin, Puerto Rican Food, Puerto Rican Recipe, Purple Sage Farms, Salad, Sofritto, Spanish Food, Special Dinners, Spice Blends, Spinach, Steamed Clams, What's For Dinner?, Whats For Breakfast? It was a good Cinco de Mayo! At least meal wise. 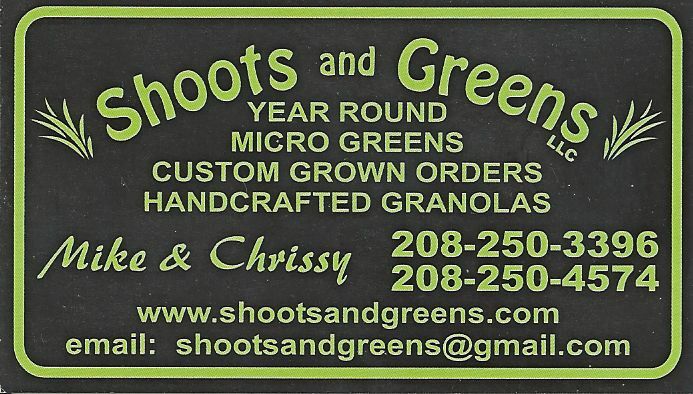 All from scratch, which really makes it fun, and then from mostly local products. Pork. Sofrito. Brown Basmati Rice. Mango Margaritas. Rhubarb Red Sauce. Black Olive and Rice Salad. Mostly fit the occasion; the holiday. The photos below will give you an idea of these meals. Left-Click any of them to see enlarged. What did you do fro Cinco de Mayo? What did you cook? Have to eat? Anything special? Let us know. Spread the delicious words;photos. Cheers! Good Cinco de Mayo dinner and fun to make! Our neighbors brought this to us, just because. Thank you! 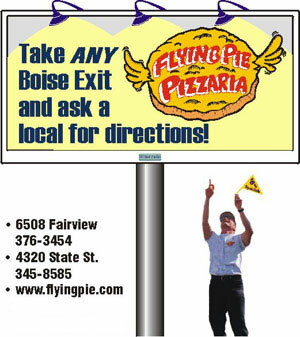 See why we love Boise? Such a differently good breakfast. Really a yummy dinner. Now for clam chowder with the broth. 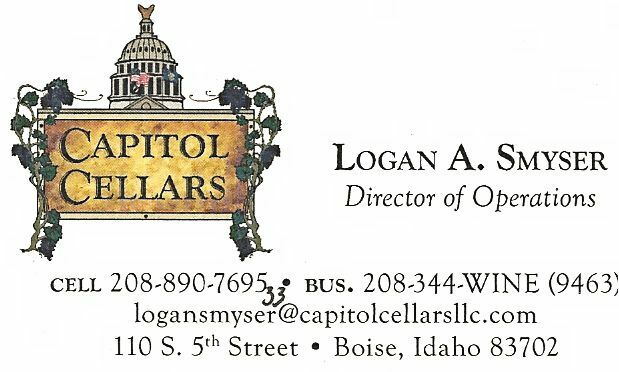 Posted by Bob and Robin in Beef, Beer and Food, Boise Farmers Market, Captain's Shack, Cinco de Mayo, Classics, Dinner With Robin, Dos Equis, Enchiladas, Ethnic Foods, Local Markets, Mexican Food, Photos By: Bob Young, Recipes, Salads, What's For Dinner? What a great use for some hamburger – Thanks Brook! Lightly fry the crumbled hamburg. Add diced onion, garlic and Ro-Tel and cook until heated. Place on one end of a 12″, Whole Grain Tortilla and roll up, folding in the ends. Place in a casserole dish and add enchilada sauce and cheese. Bake in the oven for 30 minutes at 350 degrees F. Serve with a green salad and slaw. You could serve with rice of black beans, too. Serve with Dos Equis. Then for dessert, fresh made Flan. Yum-O! Posted by Bob and Robin in Cinco de Mayo, Main Dish, Mexican Food, Photos By: Bob Young, Recipe By: Robin Young, Special Dinners, Traditional Food, Vegetables, What's For Dinner? The other night while watching the BSU football game – they won over BYU, 7-6. Not the best of games for BSU – Robin made some wonderful Robin’s Chilies Relleños as a Living Room Tail-Gate Party. These were absolutely the best I have ever had. 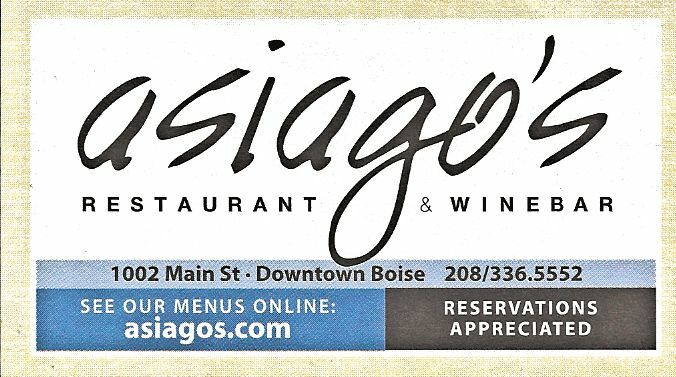 I will also link the recipe in the “Boise Foodie Blog Recipes” listed above. 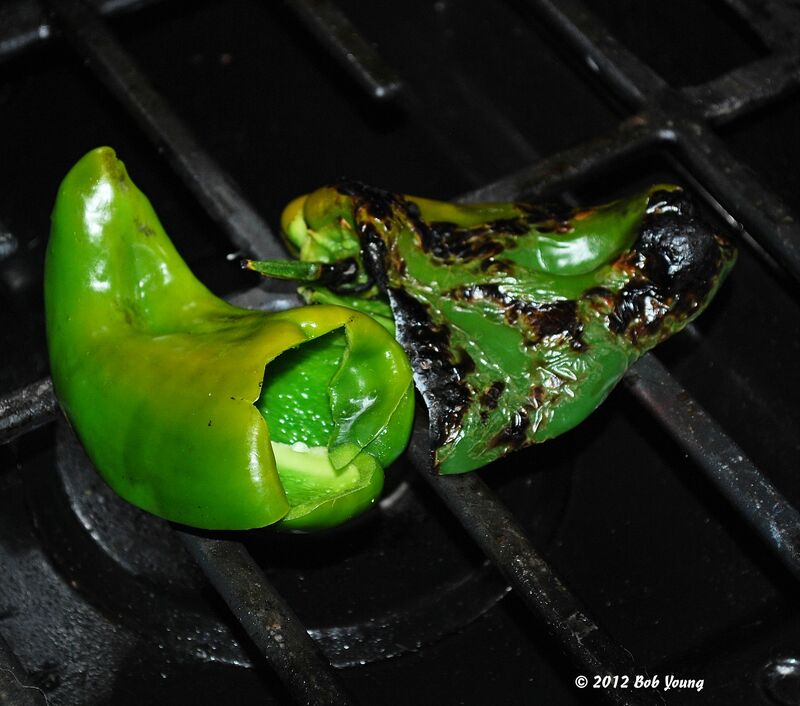 The photo on the left shows the poblanos being roasted on the stove. There is also a recipe attached to the Chilie Rellenos for a salsa. But do remember – Salsa and Chilie Rellenos are very local and recipes may change with location. Here are some more photos. Enjoy! 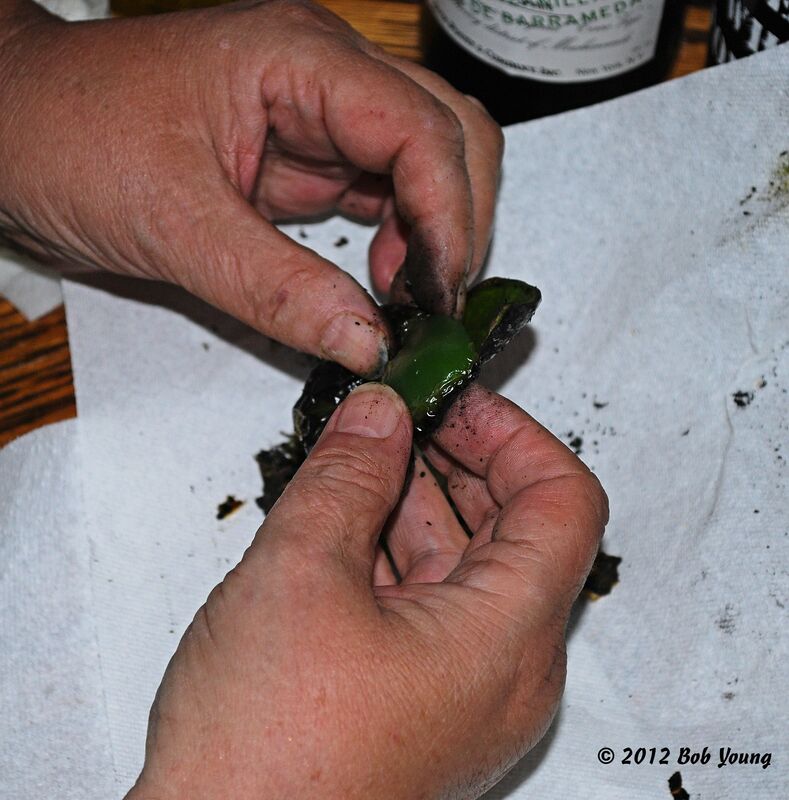 Peeling the “char” from the poblano pepper. 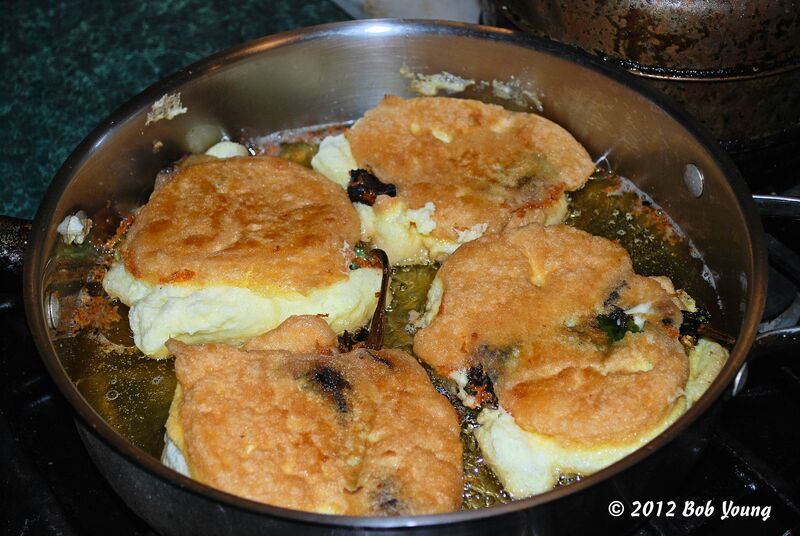 Frying the rellenos in corn oil. 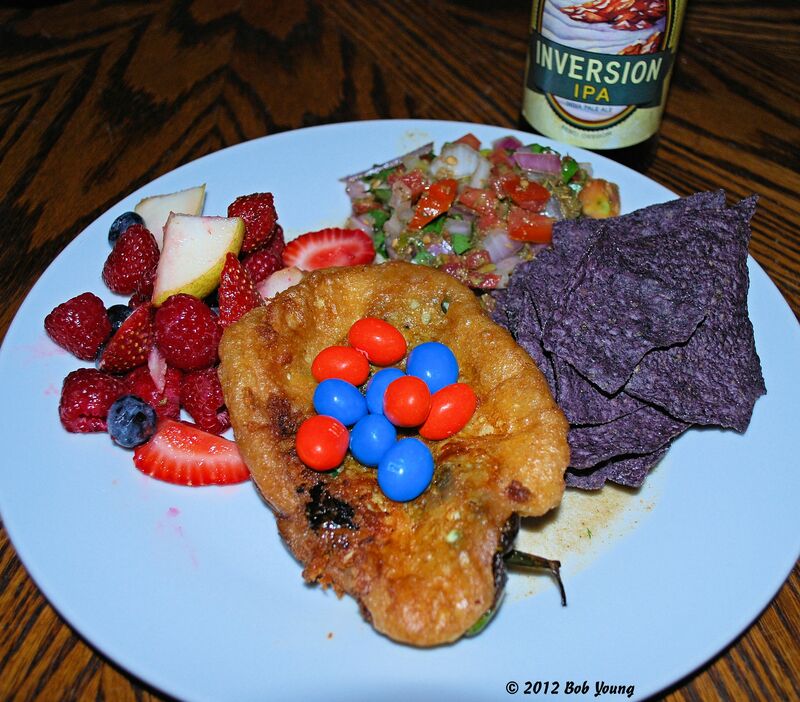 Chilie Rellenos and Tamale, Fresh Fruit, Fresh Salsa and Blue Corn Chips. And, of course, an Inversion IPA in the background. A Bronco meal! Check those colors. 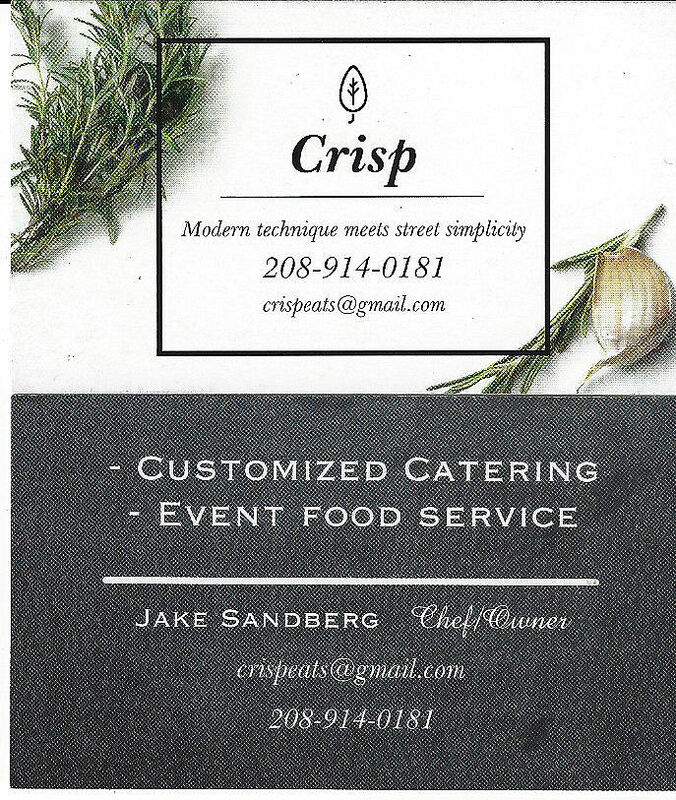 Posted by Bob and Robin in Cinco de Mayo, Hard To Find Foods, Local Markets, Locavore, Main Dish, Photos, Photos By: Bob Young, What's For Dinner? It’s been an interesting eating day. And super moon day. And Kentucky Derby day. 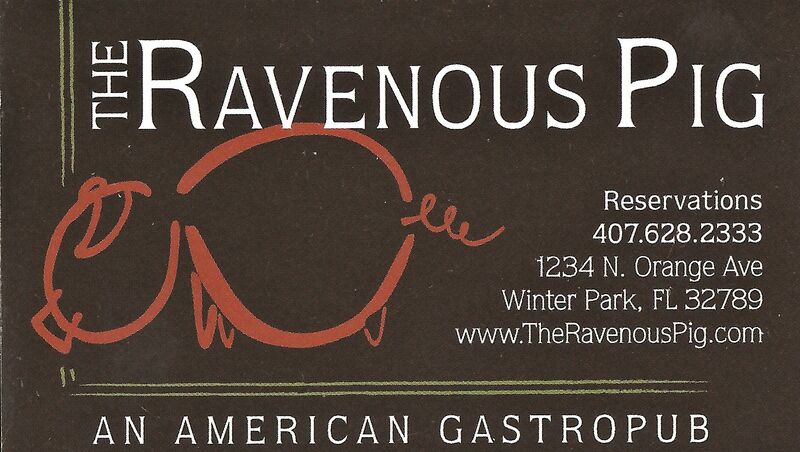 Here is what we had for dinner tonight. 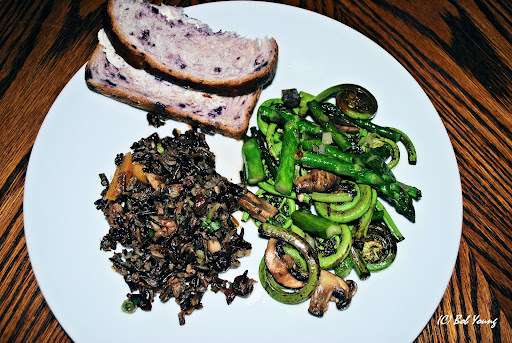 Wild Rice Salad, Fruit Bread and Fiddlehead Ferns with Ramps, Asparagus and Mushrooms. All from the Boise Saturday Market. Well …. Mostly – The bread was not. Wonderful!! 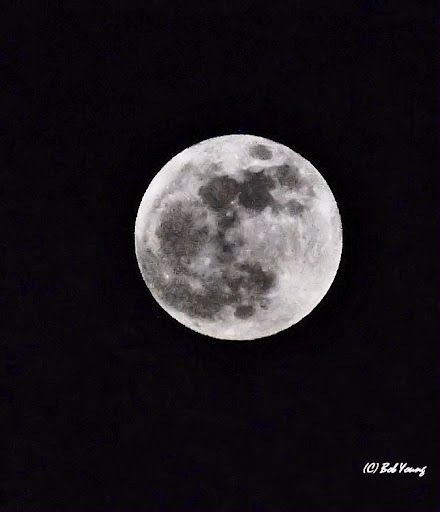 Did you see this Super Moon? Posted by Bob and Robin in Celebrations, Cinco de Mayo, Photos, Photos By: Bob Young, Soup, What's For Dinner? In other words, it’s cold here. So, Robin made this really great Tortilla Soup. Rich and spicy and great! It hit the spot during the derby. We had Mexican beer and not Mint Juleps. After all, it is Cinco de Mayo! Enjoy looking at the soup. There’s none left. Oh yes. There will be a very large full moon tonight to photograph. Hope the skies clear off. Moonrise is 8:54pm here in Boise. Cheers! 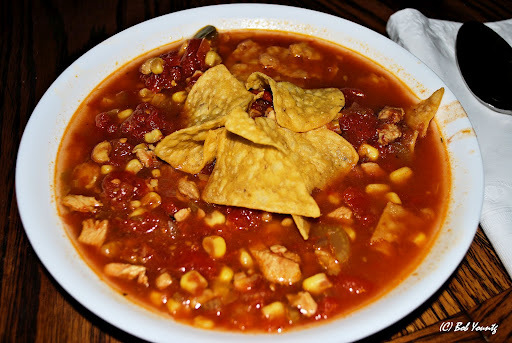 Posted by Bob and Robin in Cinco de Mayo, Ethnic Foods, Mexican Food, Photos, Photos By: Bob Young, What's For Dinner? Mix all together and set aside to marry flavors. 1. Place 4 tortillas on a work surface; sprinkle with Monterey Jack cheese. Combine the turkey and barbecue sauce in a small bowl. Scatter the mixture evenly over the cheese, along with the parsley and scallions. 2. Lay spinach leaves flat over entire surface to cover. Sprinkle with cheddar. Place a second tortilla over each, creating a sandwich; press down on the ingredients. 3. Heat a dry, nonstick skillet over medium heat until very hot. Using a large spatula, place a quesadilla in the skillet and cook, pressing down with the spatula and turning once, until the cheese melts and the tortillas brown slightly, 3 to 4 minutes per side. Remove to a low oven (250°F) to keep warm. Repeat with remaining quesadillas. 4. 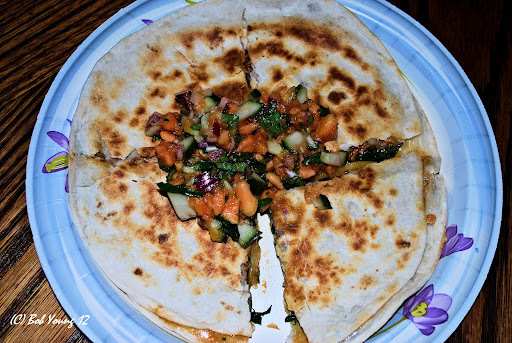 To serve, cut each quesadilla into quarters and serve hot. Serve with a bowl of whole cranberry sauce or prepared salsa alongside. Serves 4. 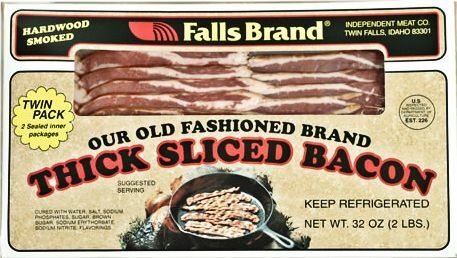 Per serving: 575 calories, 24g fat, 98mg cholesterol. This was a delicious lunch and somewhat easy to prepare. And the salsa that Robin came up with is really great. I love the lingering taste of papaya. Left-Click the photo to see full screen. Cheers and Enjoy!! Facebook really is good for communicating and getting recipes. Here is one I asked for and received from Kevin Holland, from, I believe, Greenville, NC. This looks wonderful! 1). Heat broth over medium-high heat. Add tomatillos and garlic; bring to boil. Reduce heat and simmer until tomatillos are cooked through but still hold their shape, about 1 minute. Let cool slightly, about 5 minutes, then carefully puree mixture in blender along with olive oil. 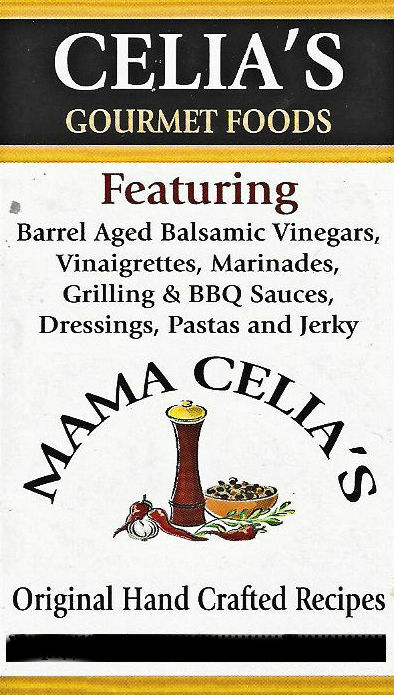 Posted by Bob and Robin in Chicken, Cinco de Mayo, Classic Sauces, Main Dish, Spice Blends, Things To Do, What's For Dinner? Sometime ago, maybe a week or two, someone, I think it was Margaret, asked me about the Mexican Mole sauce. From various sources, including Allrecipes.com, the Foodnetwork.com, waymorehomemade.com and the travelblog.com, I have found the following recipes and some description of the sauce. It is a lot like Indian curry – it can, and usually does, change with the maker or creator or chef. Cheers and enjoy. 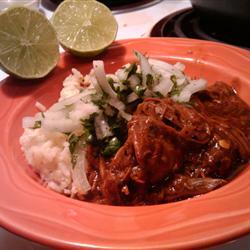 If you are looking for an authentic Mexican food recipe you should try Mole. Mole comes from the Aztec times and it is a delicious sauce prepared with zippy chile and Mexican chocolate. Mole is known all over the world and it is not hard to cook. You can add some chicken or make some mole enchiladas. Two of the most popular places to get Mole in Mexico are Oaxaca and Puebla. Oaxaca is known as the Land of the Seven Moles and Puebla has also a great variety of Mole. When cooking Mole you need to add some Mexican chocolate so the taste is a little bit sweet and not as strong as the mole itself. Mole can be prepared in different ways, depending on the state or traditions of each family. 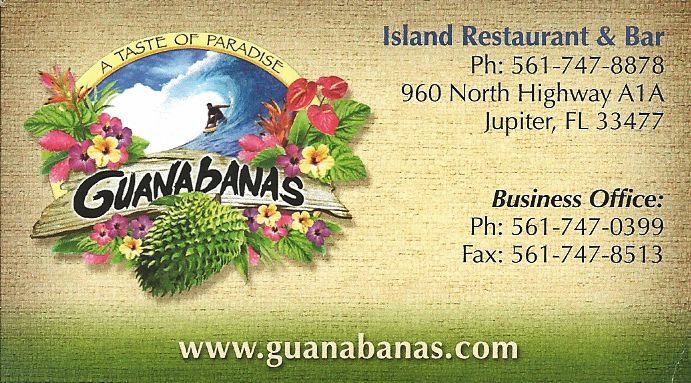 Some of the ingredients include cloves, peanut butter, bananas and epazote. There are also different types of mole. For example you can find yellow mole, red mole, black mole, green mole and the famous one – tablecloth stainer known in Spanish as the ‘mancha manteles’. You can serve some chicken and rice to make a complete, perfect meal and enjoy it with some Crema Mexicana Mexican style sour cream, white fresh Mexican cheese, and bolillos. 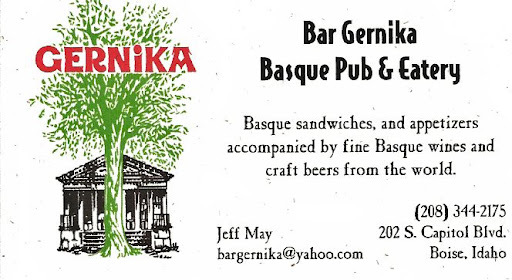 Why wouldn’t the cooks of Cerén have developed sauces to serve over meats and vegetables? After all, there is evidence that curry mixtures were in existence thousands of years ago in what is now India, and we have to assume that Native Americans experimented with all available ingredients. Perhaps this mole sauce was served over stewed duck meat, as ducks were one of the domesticated meat sources of the Cerén villagers. Cerén, or Joya de Cerén, is the name of a village in El Salvador that was destroyed by a volcanic eruption. Known as the North American Pompeii, because of its level of preservation, Cerén offers a fascinating glimpse into what life was like 1400 years ago. In a blender, combine the tomatillos, tomato, chile seeds, pepitas, tortilla, chile powder and achiote to make a paste. 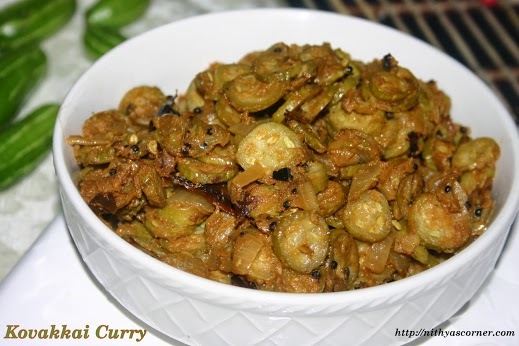 In a pan, heat the vegetable oil and fry the paste until fragrant, about 4 minutes, stirring constantly. Add the chicken broth and the chocolate and stir over medium heat until thickened to desired consistency. Combine chiles, onion, garlic, tomatoes, 1 Tbsp sesame seeds, almonds, tortilla, raisins, cloves, cinnamon, and coriander. Puree small amounts of mixture in a blender until smooth. Heat oil in a skillet and saute the puree for 10 minutes, stirring frequently. Add chicken broth and chocolate and cook over very low heat for 45 minutes. The resulting sauce will be quite thick. Traditional mole sauce can be either red or green, depending on which ingredients you decide to use and is normally served over chicken. Experiment! I do hope this helps with your question, Margaret. It goes quite well, and I think designed for chicken or turkey. But it can also go with pork or beef. I don’t think I would use a mole sauce with seafood. You can also find a Mole Sauce and Paste, to use as a starter for future recipes, at http://www.waymorehomemade.com/2010/04/mexican-mole-sauce-foodie-friday.html. Cheers! 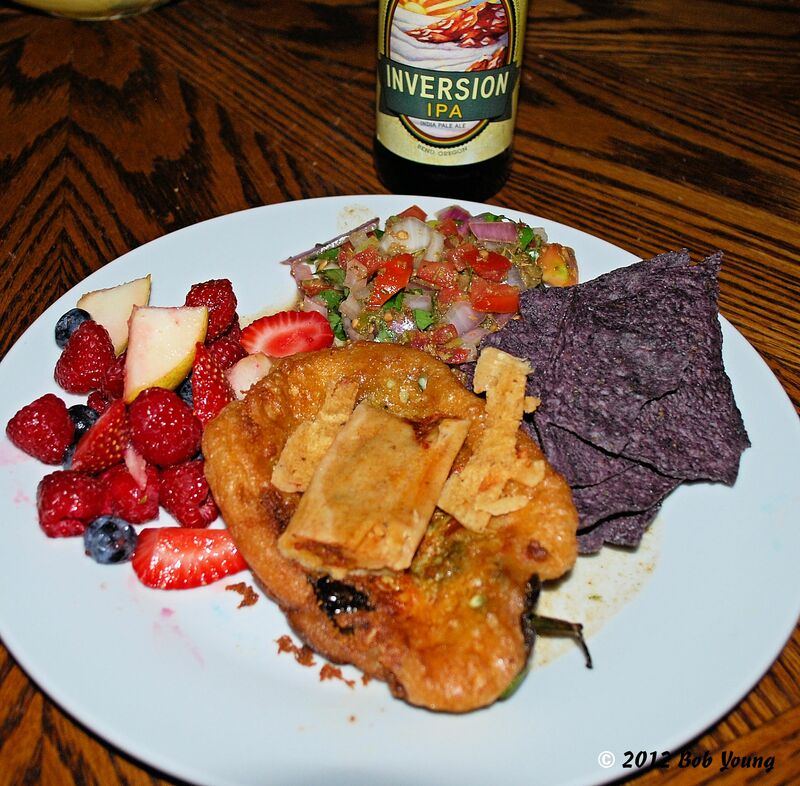 Posted by Bob and Robin in Cinco de Mayo, Main Dish, Party Time, Recipe: Bob and Robin Young, Things To Do, Traditional Foods, What's For Dinner? Cinco de Mayo (5 May) is right around the corner. And what a better way to celebrate than to make some beef cheeks (barbacoa). Here is a recipe that is pretty easy to make, but it takes some time. Enjoy these. Cheers! The marinade turns into a thick, rich almost mole-like sauce … delicious! Slice the onions very thinly and put them in a microwaveable container. Add the beet, cilantro, salt and sugar. Cover everything with the water/vinegar mix. Microwave for 1 minute, stir, and microwave for another minute. Cool, then refrigerate overnight. The beet will turn it a really pretty hot pink color. Clean and trim the cheeks. Put them in a container that you can marinate them in. Peel and chop the garlic. Put everything from the garlic to the salt in the food processor (including the water from the chili) and blend into a paste. Toss the paste with the cheeks and marinate for several hours or better yet over night. When it is time to cook, heat the oven to 275ºF, and heat 2 T olive oil in a Dutch oven. Brown the cheeks on both sides. Use the stock to rinse the rest of the marinade into the Dutch oven, then squeeze the juice of 3 limes in. Bake at 275ºF for 3½ hours – turn the cheeks over once or twice while they cook and if the liquid dries up add a bit more stock. When the cheeks are fall-apart tender, take the pan out of the oven. Using 2 forks, pull the meat apart in the pan so that it mixes in with all of that fatty juicy goodness. To serve – heat 2 tortillas. 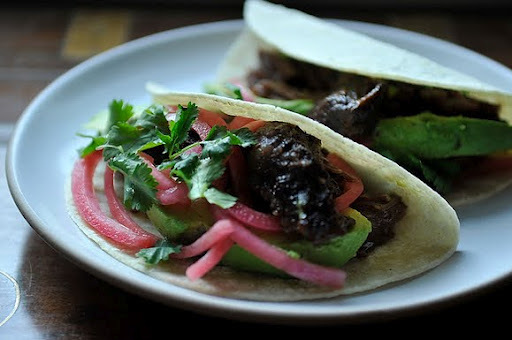 Fill with barbacoa (beef cheeks), a slice of avocado, some of pickled onions and fresh cilantro. Serve and enjoy!!! 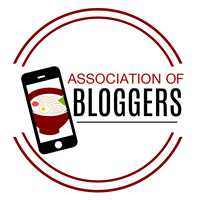 Join us on Facebook in the group Here’sWhat’s Cookin!